From fairly early in the show’s run, Nimoy seemed to realize the symbolic power invested in Spock, and perhaps to mistrust or fear it. “The network, and a good many fans, would have been happy if the show had been called ‘The Mr. Spock Hour,’” confessed Star Trek writer David Gerrold in his book The Trouble With Tribbles. As a professional who prided himself on his versatility, he resisted being identified too strongly with a single role — it’s the main reason he went on to play Paris, the “master of disguise,” on Mission: Impossible from 1969–71 — and it was a long time before he entirely made peace with the legacy he’d done so much to shape. 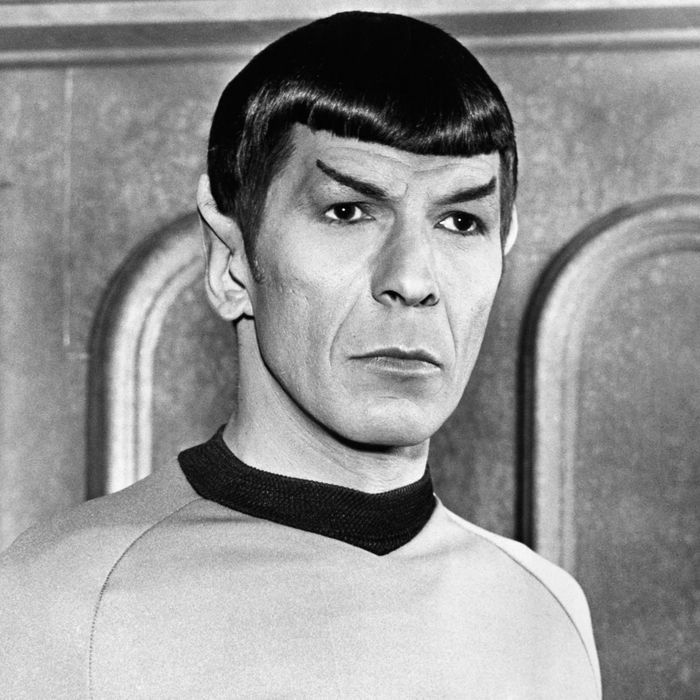 After Star Trek got canceled, then became a surprise syndication hit in the early ‘70s — spawning a cartoon, several more live-action series, and a hit film franchise — Nimoy published a philosophical rumination on his acting career titled I Am Not Spock; 20 years after that, he published a sequel, I Am Spock. The second title was partly meant to quell fans’ concerns that the first book’s title meant Nimoy resented them for adoring the character. But anyone who’s read both books can testify that his attitude was always conflicted and complex, mingling skepticism, gratitude, and fascination. The proof can even be seen in the books’ choice of cover art: They don’t signal “either/or,” but “both/and.” The first carries a black-and-white photo of Nimoy performing the character’s split-fingered Vulcan salute, hardly the clearest way to isolate himself from his character. But while the second book’s title affirmed Nimoy’s basic allegiance to Spock, the cover showed him in an actor’s head shot pose, with a neatly trimmed beard and close-cropped hair and a tasteful dark sport coat: civilian garb, as it were. Either volume could have been titled I Am and Yet Am Not Spock. This is a big part of the reason why the character or Spock — a “half-breed,” per Dr. McCoy’s slur, in some ways passing for human while staunchly insisting on his cultural Vulcan-ness — made such a powerful impact on viewers who felt, in one way or another, like outsiders. Counterculture-minded whites adored the character, naturally, and the show clumsily tried to capitalize on this in a silly third-season episode, “The Way to Eden,” wherein Spock was basically adopted as a harp-strumming mascot by space hippies. One of the infinite number of ways to read the character was as a person who had to tamp down his undeniable individuality in order to function as part of an institution with hard rules and hallowed traditions. In the 2005 book Stars of David: Prominent Jews Talk About Being Jewish, Nimoy talked about being typecast because of his decidedly non-Waspy looks. ““Guys like me were playing all the ethnic roles, usually the heavies — the bad Mexicans, the bad Italians. And those were the jobs that I took and was happy to get for a long time. I played Indians in Westerns many times. The first Indian role that I took was a role that a Native Indian turned down because the Indian character was so unredeemably bad. I was happy to get the work, thank you very much.” Nimoy created the Vulcan greeting — a forked hand with upraised fingers — based on his memory of “seeing the rabbis do it when they said the priestly blessing.” Throughout the run of the original series, you can see Nimoy, Roddenberry, and the writing staff integrating more and more culturally specific touches; the apotheosis might be Spock’s resuscitation at the end of Star Trek III: The Search for Spock, which takes place amid slender, jagged What’s Opera, Doc? mountain spires but features Dame Judith Anderson delivering fiery rabbinical incantations; the cognitive dissonance here is spectacular and delightful, as if Wagner had momentarily been claimed for the chosen people. Six years ago, on the eve of the release of the first Star Trek reboot, I did a video (embedded below) that tried to get at Spock’s eternal inside/outside status. I ended it with Nimoy, in one of his many rough but touchingly sincere musical performances, singing “Where Is Love,” from Oliver! It’s so easy to laugh at recordings like this one — like so many stars, Nimoy couldn’t resist an ill-advised attempt to conquer one more art form — but if you think of Mr. Spock, the space hero whose coiled passions were rarely signified by anything other than a raised eyebrow, it’s strangely moving. Where is love? Spock never really found it anywhere but on the deck of the Enterprise: in the job where he could be fully actualized, fully himself. The final frontier is contentment.